Kiwi have existed in New Zealand for millions of years. 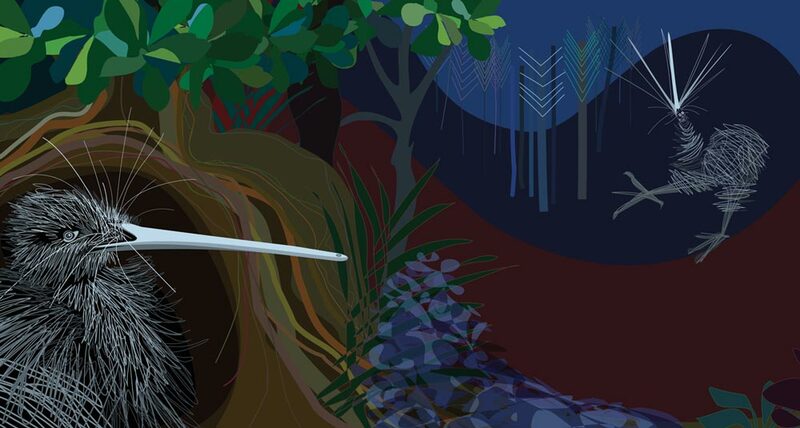 Extensive Kiwi populations once roamed over all of New Zealand, but loss of habitat and the spread of predators has seen this picture change dramatically. The decline has accelerated in the last 30 years: today, the number of Kiwi in unmanaged areas is halving every 10 years. 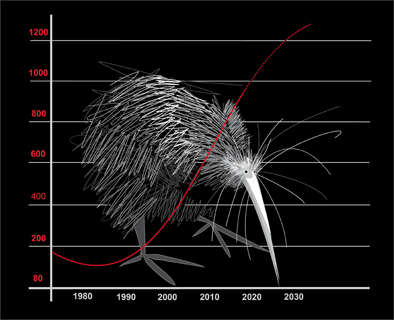 If this rate continues, Kiwi will be extinct on the mainland in our lifetime. There are five different species of Kiwi in New Zealand, all of which are considered endangered or critically endangered. In Northland, Brown Kiwi were found in most forests and shrubland areas prior to 1970 from the Brynderwyns to Awanui. However, their population decline has been rapid. They have disappeared from many Northland areas and exist now only in a number of small concentrations. Today, community projects like Backyard Kiwi have managed to turn this decline around in some parts of New Zealand. Whangarei Heads is one of these places. Kiwi have evolved in NZ in the absence of mammalian predator and competitors. This meant they evolved to be ground dwelling and flightless. They did have predators, such as large hawks and eagles, so to avoid them they became nocturnal. Their feathers are more like hair. They have feathers that have evolved to work like whiskers. They large ears and very good hearing. Kiwi are the only bird with external nostrils at the end of their bill – a lot like your nose. Their body temperature is more like a mammal’s at 38 degrees compared to most birds at 40 degrees. Unlike most birds they have marrow in their bones. They have two functioning ovaries when most birds only have one. They are the only bird in the world with no tail. Kiwi couples are also pretty interesting. Kiwi are mostly monogamous – they pair for up to 50 years. The kiwi dads sit of the nest for one of the longest incubations of any bird at about 80days. Female kiwi are bigger than male kiwi, because she lays 2 large eggs in close succession (10 days apart). Kiwi chicks are hatched fully feathered, unlike other birds. Adult Kiwi are territorial, and call to let other kiwi know where they are. At Whangarei Heads you can hear kiwi calling everywhere. Autumn and early winter are the best times to hear them. Listen to a kiwi now! Kiwi live in may different habitat in the modern world ranging from native forest, pine plantations weed infested roadsides, farmland and people’s backyards. They smell – unfortunately, dogs find them irresistible.